Most people, when preparing a drink, only think about the major elements. Think the alcoholic base, the fresh citrus juice, the delicately prepared syrup. Some go further and consider finer elements: the dazzling complexities of cocktail bitters or the benefits of matured citrus juice. Those are certainly details. But here I want to sing praise to a different kind of detail. Things you wouldn’t intuitively expect to appear in drinks, least of all improve their flavor profile. Things like salt which, added in a cautious manner, brightens up the flavor of a drink. Now I don’t claim that these details in any way dominate the flavor of your drink, it’s more of a subtle effect of a subtle ‘ingredient’. Okay maybe not that subtle in all respects after all. Because the first detail we’ll have a look at is an insect. In your drink. Specifically, I’m talking about the caterpillars and larvae in some brands of mezcal. Not as well known as tequila (yet), mezcal is actually the superset of tequila. So every tequila is a type of mezcal but not vice versa (think bourbon and whiskey). And while tequila is solely made from blue agave (the eponymous Agave tequilana), there are over 30 types of agave which are used for mezcal production. Anyways, at some point in the 50ies, the producers of Gusano Rojo (one of the most popular brands of mezcal in Mexico) decided to add larvae to their mezcal as a marketing gimmick (yes, sometimes it’s even more than one insect per bottle). And it stuck. While far from all mezcal bottles boast their very own critter, many commonly available mezcals will greet with you with an insect at their bottom. Mezcal is frequently ‘decorated’ with the larvae of some well-known agave pests and seems to modify the flavor profile of the Mexican spirit. You would be sorely remiss if you think that nobody except maybe college students really cares about the little inhabitants of mezcal bottles. When the Mexican government tried to prohibit the addition of larvae to mezcal in 2005 in an effort to improve the visuals of exported mezcal, distillers went into open rebellion and refused to produce mezcal sans larvae. The gusano rojo (literally ‘red worm’) that is added to the Gusano Rojo (among other mezcals) after being cured in pure ethanol is the caterpillar of the moth Comadia redtenbacheri (and therefore actually not a worm). Alternatively, sometimes the larvae of the agave weevil Scyphophorus acupunctatus are added to mezcal. Both of these species feed on agaves which makes it an even more fitting revenge to witness the lurid display of their youths, drowned in the fermented & distilled sap of the very same plant they devastate. But enough about history, let’s talk about flavor! Believe it or not, there is in fact research about the flavor effect of larvae added to mezcal. There are three categories of mezcal: white (fresh), rested (3–6 months of aging in an oak cask) and aged (at least 12 months in an oak cask). Insects are only added to white & rested mezcals so we focus on the flavor profile of these two. Analyzing the composition of white & rested mezcals with and without larvae (via a technique known as mass spectrometry) researchers found that some unsaturated alcohols, a type of chemical compounds, were only present in the mezcals with larvae. So in addition to being a marketing gimmick, these little caterpillars actually modified the flavor profile of mezcal. Most prominent among these larvae-derived compounds was cis-3-Hexen-1-ol. You might know it under a different name: the smell of fresh-cut grass. 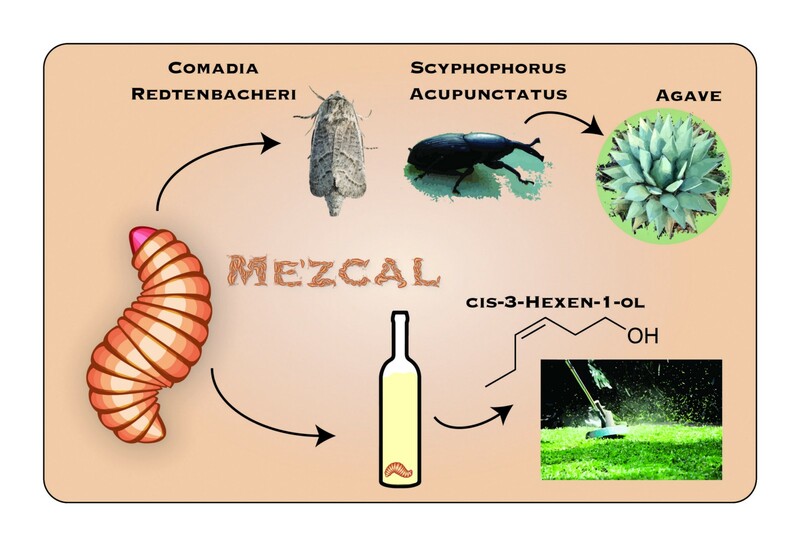 Other chemicals introduced by the larvae, such as pentanoic acid, are also detected in aged mezcals but not in larvae-free young mezcals. While by itself pentanoic acid has a rather unpleasant ‘farmyard’-like smell, it can chemically combine with alcohols to form fruity-smelling esters. Next to these obvious flavor effects, mezcal larvae introduce a few more chemicals which are not so obvious to categorize in terms of their impact on the final product (among them tongue twisters such as 6,9-pentadecadien-1-ol or 1,8-nonadiene). But suffice it to say that details matter here and you certainly shouldn’t shun a good bottle of mezcal just because you’re grossed out by the insect floating at the bottom. Maybe it’s there for a reason. Next, we leave the high-proof spirit world for a bit and turn to wine, the only artwork you can drink according to Luis Fernando Olaverri. More precisely, we turn toward a fine detail in wine: cork. Used to close wine bottles since centuries and still present in more than 70% of wine bottles all over the world, cork seals do have some advantages. The diffusion of oxygen (one milligram per year) through the somewhat porous cork into the wine can lead to subtle chemical changes. Specifically it prevents the formation of foul-smelling sulfur-containing compounds and can lead to a color stabilization in red wine by a reaction with the color pigments (anthocyanins). Additionally, cork transfers vanillin (vanilla aroma) as well as ellagitannins (flavonoids which increase astringency) to the wine. The small seal of a wine bottle can both subtly tweak the flavor profile of its contents as well as ruin it entirely through a process known as ‘cork taint’. While objectively there may be chemical changes dependent on the presence or absence of a cork seal, interestingly enough wines from bottles with cork seals or screw-top seals couldn’t be differentiated by most tasters in a blind tasting. Yet if you don’t perform a blind tasting but let people witness the opening of the wine bottle, tasters in the group with cork-sealed wine bottles rated their wine better on average. Effectively, the plopping sound of a wine cork being removed led them to enjoy the wine more which probably tells us more about ourselves and our expectations than about the influence of cork on flavor. And while it may not have a drastic positive effect on most consumers, cork certainly can have a devastating effect on taste in extreme cases. Around 1–2% of all cork-sealed wine bottles are affected by something called cork taint. You may have already experienced this phenomenon. If not, it’s a characteristic moldy paper / damp basement type of smell which can thoroughly ruin a perfectly good wine (interestingly enough, it’s completely harmless from a health perspective and we actually adapt pretty quickly to the smell). The cause for cork taint is a molecule known as trichloroanisole (TCA). For this molecule to come into existence, lignin (a major component of wood) from the cork has to react with chlorine to form trichlorophenol which is further modified by an actual mold into TCA. How does the chlorine come near the cork? Ironically enough it’s usually part of an antimicrobial agent used for treating wood to remove the very same mold that can convert it into TCA. And you shouldn’t underestimate TCA, as it’s one of the most potent known aroma molecules with a sensory threshold of around one in two hundred billion. To put that into perspective that’s roughly as if you could pick out a single grain of sand in a square meter of beach! Anyone who has ever used cocktail bitters in their drinks certainly can attest to the flavor impact mere drops can make to a cocktail. Linking, boosting and augmenting flavor, details such as bitters or salt certainly have a firm place in the repertoire of a cocktail aficionado. Yet there are many more elements comprising a finished drink, many more details to pay attention to for the perfect gustatory experience. Some, such as the caterpillar floating in your bottle of mezcal, can add flavor details and potentially even emulate some of the notes of aged mezcal in younger bottles of the spirit. 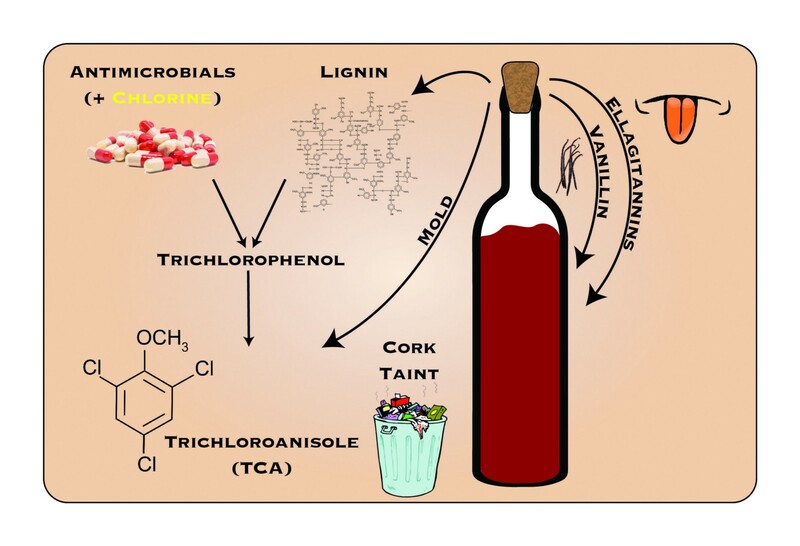 Others, such as the inconspicuous cork sealing a wine bottle, have the potential to utterly wreck a drink through minuscule amounts of cork taint compounds such as TCA. While details such as these may be small, they do have to be reckoned with as their effects on a drink’s flavor profile (both good and bad) can be dramatically larger than their appearance.